Coaching might sound like a luxury, but nowadays, coaching is a necessity – to develop your career, get to the next level in your life or business, build your confidence, have better relationships and so much more. Hypnosis coaching is even better – it also helps you to heal your past so that you stop sabotaging your dreams and goals and ultimately, your future. That’s why it’s a necessity. So what would your default future look like without hypnosis coaching? How long have you been carrying around an issue that’s stopping you from being who you really want to be? What if you don’t do anything (like hypnosis coaching) and nothing changes? What does that life look like? What are the consequences? How painful is it? On the other hand: What would it feel like to sort it out and be able to move forwards boldly? Get ahead in leaps and bounds? How would dealing with things that are holding you back make your life better? Draw a line down a piece of paper and write two lists: your default future without hypnosis coaching vs. taking your future into your own hands with hypnosis coaching. And be amazed! But why coaching? Why not go to a counsellor? Well, the difference between hypnosis coaching and traditional psychotherapy is that you can go to psychotherapy for years, not really know what you’ve achieved. You mostly deal with the past. How many clients have told me that they’ve been going to a counsellor for years but after a few sessions with me, they feel like a new person! Hypnosis coaching is much different. It’s goal or solution-oriented. It’s tailor-made to each client and highly personalised. You are the agenda. And it gets results fast (usually in 3 to 6 sessions over the course of one to three months). Yes, you can deal with the past too, but only in as much as to be able to understand how the past is (consciously or subconsciously) holding you back from achieving your goals so that you can move forwards without sabotaging yourself again. 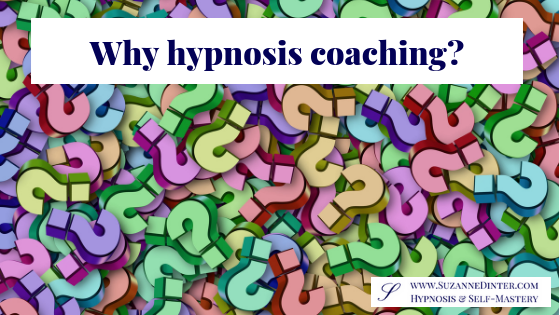 Do you want to experience the power of my hypnosis coaching? I’d love to astound you with the possibilities you can’t yet see for yourself! My limited offer of a free, powerful, full-length, tailor-made first hypnosis coaching session has proven to be so successful that I have decided to extend it indefinitely! However, a word of warning: My hypnosis coaching is not for everyone. It is only for those willing to do the work. For those who are committed to change, no matter what. Who are prepared for things to get emotional before it gets much better. Those who refuse to continue living a default life. Who are determined to start shaping their future themselves. I’ll then send you a link to book your free appointment and you can start shaping your dream future.